This past weekend I had a little cookout and snapped a few hurried pictures before we ate. The weather was so great this evening....perfect for dinner on the deck. I brought the docking station outdoors and turned up the music. Summers are short and blooms are plentiful. That adorable cake server was a gift from a friend, and the artist is Molly Hatch. I will use it often! I've been making Pioneer Woman's Crash Hot Potatoes since 2008. We typically serve it with steak, corn on the cob and a tossed salad or zucchini dish. We recently served it with venison and enjoyed it. It's still very much summer here but fall is just around the corner. I ordered the striped rug two months ago from Williams Sonoma and it just arrived last week. They agreed to deduct the shipping charge of $35 due to the delay. I scored the burlap utensil holders at the Country Living Fair in Rhinebeck, NY. 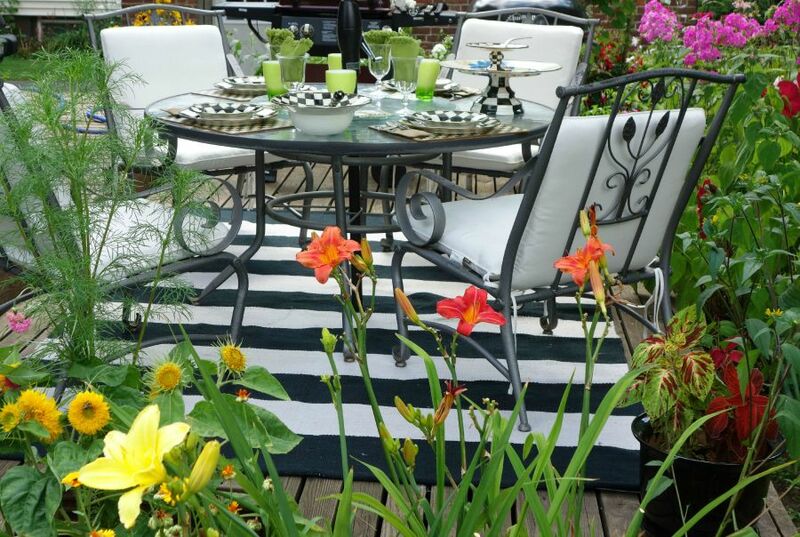 I am joining Susan at Between Naps on the Porch for Tablescape Thursday, and Rattlebridge Farm for Foodie Friday. Thanks so much for your visit! 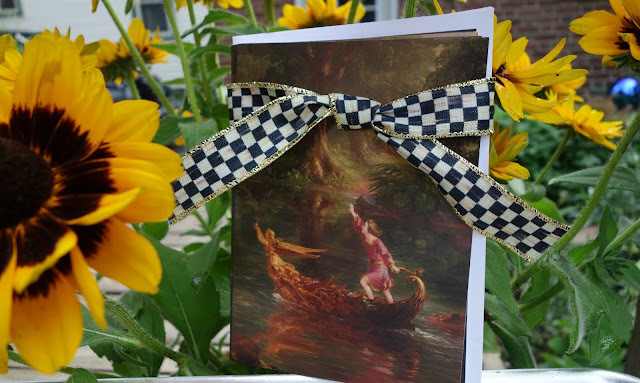 Before you leave, anyone who leaves a comment with an email link on this post will be entered in my Voyage of Life giveaway. Winner of four photo cards and a surprise gift will be notified on August 14, 2015. LOL, only me ;o) You know me ;o) We've had very little rain, and the farm where I get my veggies said when they dug potatoes on Monday, it was like digging them out of concrete. Kitty, you have a wonderful patio too with your relaxing fountain! Summer is going quickly, and I heard August might be cool. July was so hot! What a great MC inspired table! I love those napkins. Cute silverware pouches, too. Thanks Marigene! If only you lived closer, we would have so much fun "dishing" together. 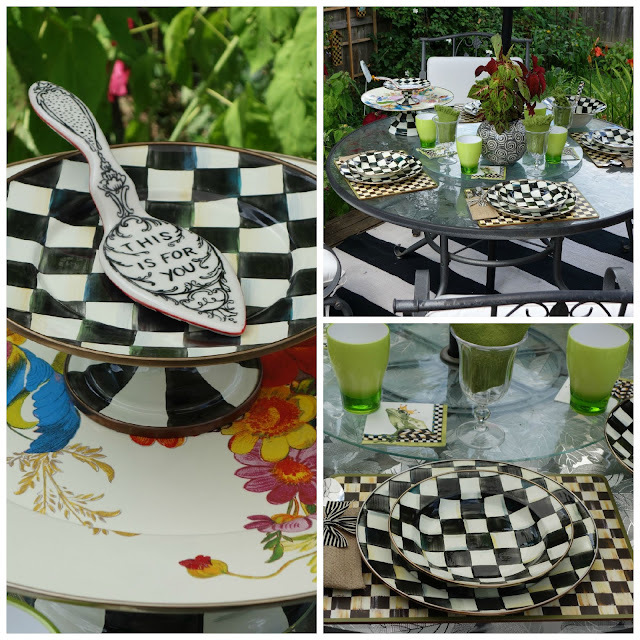 What a coordinated backyard dining area you have - worth the wait for the rug which goes wonderfully with those dishes! The pop of green with it is stunning! My hubby HAS to have the docking station and "tunes" playing while we enjoy our dinner al fresco - it does set the mood - espec when you have a setting like yours! Thank you Lori! I just came from your blog and love the Italian wine-themed tablescape you created for a friend. Your friends are lucky you are so creative! A lovely table and that Prince of a Frog is my favorite. Julia, I'm glad you stopped by for a visit! The paper frog napkins are so much fun for summer outings. Looks like a great area to entertain - lovely table! Thanks for sending the napkins! Love your MC!!! After waiting so long on the rug, I'm glad they made it right. The rug is perfect though. I think I'm going to have to find those placemats! I can see those being used everyday around here. Thanks for a chance. Hi Marlis, nice to hear from you! We use the placemats every day in the summer, and I know you will enjoy them too. Of course I am having plate envy, and cake pedestal envy, bowl envy, and placemat envy! So gorgeous! One of my favorite designs!! The rug looks fabulous. Hope the weather holds out for a long time so you can enjoy it. The napkins are fabulous too. I love the touch of burlap with it. Those would be fun and easy to make. Hi Jacqueline, for years I couldn't decide on what dishes to buy for outdoor dining. My husband convinced me to go with the MacKenzie-Childs enamelware and I'm so glad I did. It's very versatile. You could easily make the burlap silverware holders! Your new rug is perfect for showing off your Courtly Check Debbie! Love that server, lucky you, it's adorable! Love the burlap utensil holders in your patio setting, enjoy! Hi Jenna, I agree that the server is absolutely adorable. I feel very fortunate to have such wonderful blog friends. Enjoyed the glimpse into your garden and deck. Black and white always makes an impressive table! Hi Darlene, and welcome! Thanks for your kind comment. That frog is really cute with the black and white checks. First time I've been here and will be back soon. Hopped over from the Share Your Cup party at Mrs. Olson's. So glad you will be back! Thank you for your visit. Debbie, I want to join you for dinner! This alfresco setting is charming. It's too warm here to dine out on the terrace. Love the napkins. I've tried to get some, but they are on back order. Don't they make you smile? Sarah, you know you are always welcome! Hope to see you in NY sometime soon. 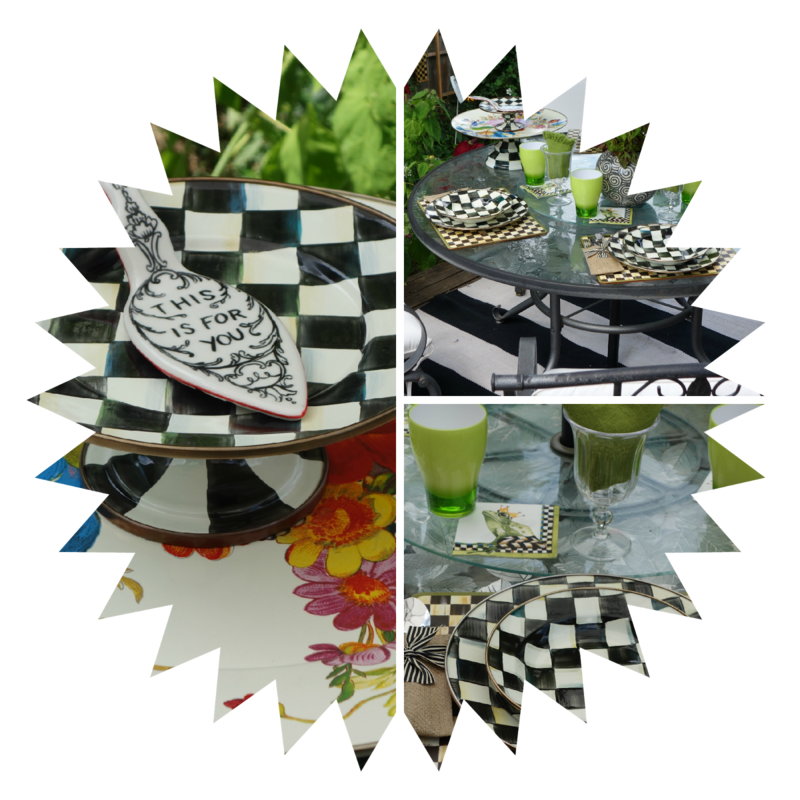 Love your Mackenzie child's dinnerware!! Isn't it just so fun! I hadn't seen those napkins before, they are darling! That new rug goes well with the MC stuff! Linking from foodie Friday! Angelina thank you so much for your visit! Just a stunning table in beautiful surroundings. I will keep fingers crossed for your generous giveaway. Hi Christine, thinking of you in your new home! Thanks for your visit. You don't have to have a blog to enter the drawing for the giveaway. I've received four emails asking if I would include their name in the drawing. Sure!! I love the look of the black and white checked MC plates and the black and white striped rug, they look as if they were made to go together. Your flowers look beautiful as a backdrop to your dining table. The black eyed Susan's are all in bloom around my patio. We love to have our meals out there when the weather is good. I will be having a giveaway at my blog for my second blog anniversary coming up very soon. Hi Candy, we are both lucky that we have the black eyed Susan's to enjoy! Congratulations on your second blog anniversary.